Just on the back of SieMatic’s New York grand opening, we made a trip to Chicago for the new kitchen/bath/outdoor fixture retailer Pirch’s opening party. Since Mick was involved with SieMatic’s display designs in this new groundbreaking store, we were eager to make the trip and get the brand’s full experience. 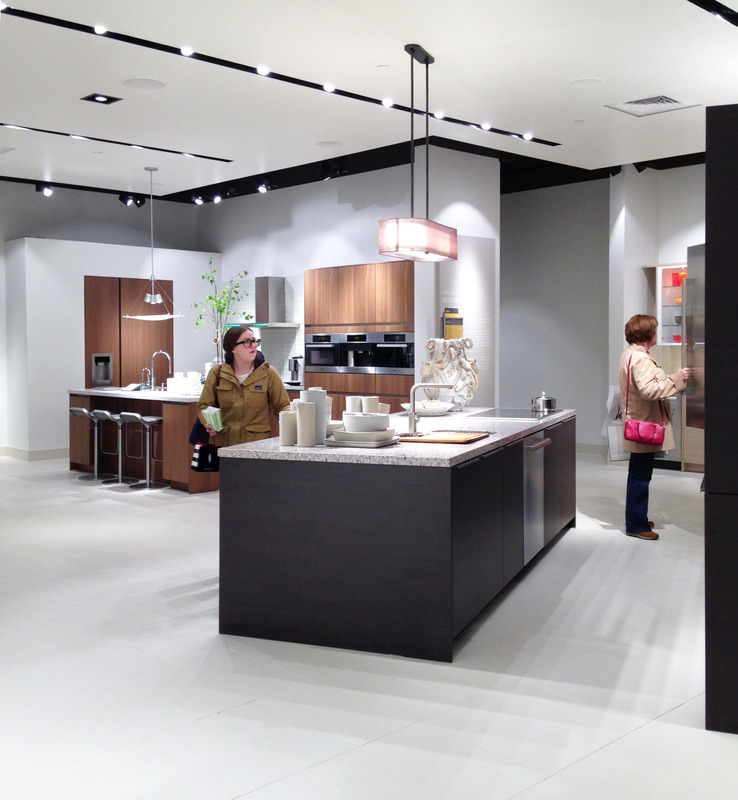 Formerly called Fixtures Living, Pirch – http://www.thepirch.com/ – is a relatively new store concept based in California. As shown above, one enters the Oakbrook Center store up an escalator from the upscale outdoor mall. Upstairs is a very large department store-like interior of about 30,000 square feet. 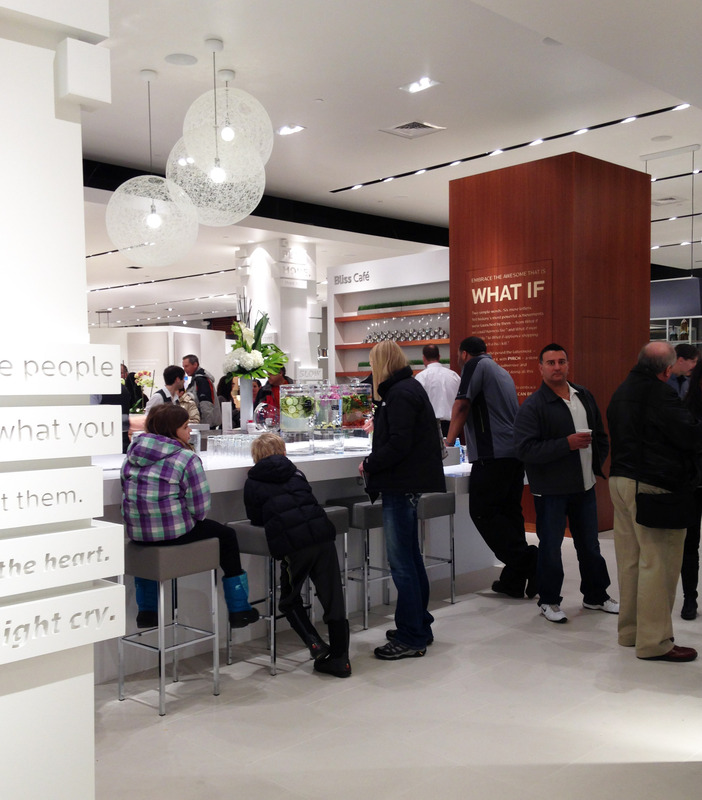 Pirch’s bright interior concept opens eyes to every visitor who makes the visit. Pirch, now with 4 locations (Glendale, San Diego and Costa Mesa precede Chicago), are doing things a little differently than other home-product stores. First thing entering the huge foyer is Bliss Cafe, a with-compliments espresso bar captained by happy baristas ready to make you feel at home. Happiness is one of the brand’s core values; their tagline is Live Joyfully. Little messages and mottoes adorn the store, reminding you that life is short; think positively and renovate your home smartly. It’s an infectious environment and the bright interior keeps your eye moving. Large bathroom environments are to the right, and our kitchen displays to the left. Behind the cafe is the Boulevard, which leads to more experiences which I will share below. First, our kitchen area. There are 16 (!) kitchen displays. 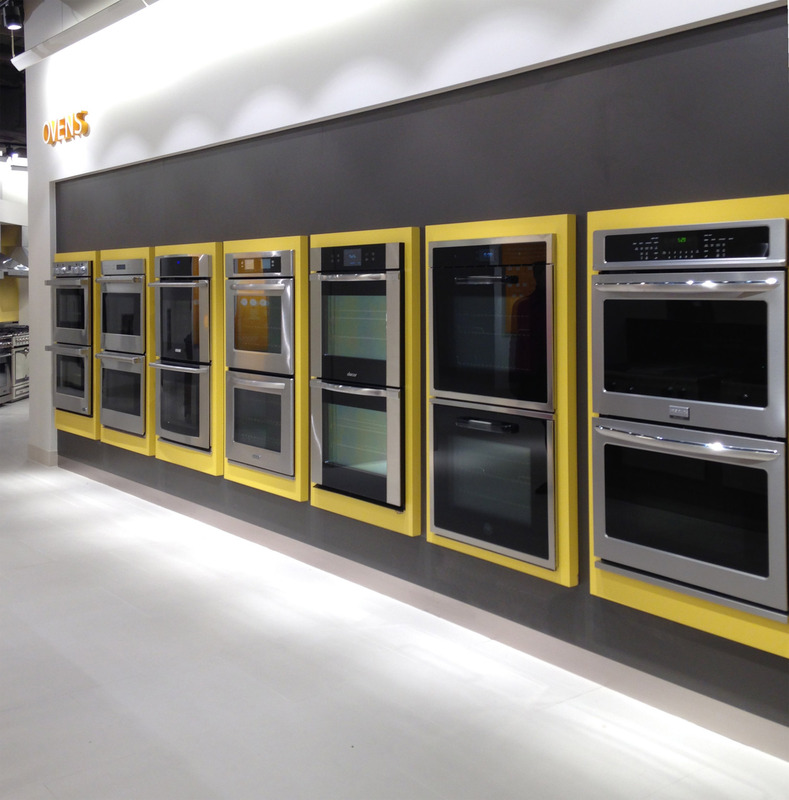 Each display represents a full appliance package from some of the best brands; Sub Zero/Wolf, Miele and Gaggenau as well as popular brands such as Kitchen Aid and Jenn Air. Pirch’s store designers gave us the general footprint and a display concept and we set about making each display a SieMatic original. Each display has an integrated styling concept, and all of the accessories are for sale. 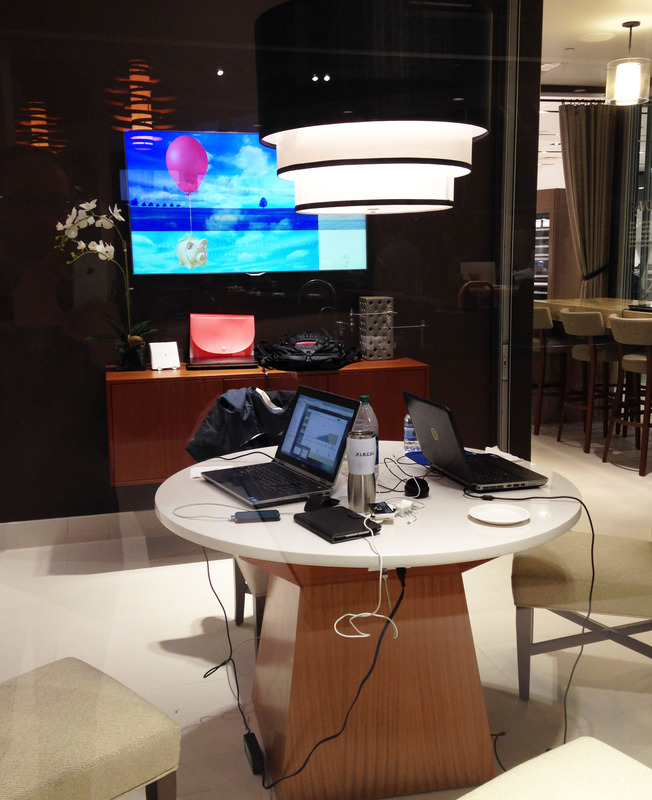 Each display concept is fundamentally identical at each location as well, making future changes more simple. The most amazing thing is how everything works; the faucets are live, the vent fans turn on, the ovens and microwaves cycle through their menus, the refrigerators are quietly humming along. The bathroom area is the same too – you turn a faucet anywhere in the store and you can wash your hands. We have been working closely with Pirch to make each environment as distinctive as we can, with seating areas and real layouts wherever possible. For consistency however, Pirch keeps the same high ceiling clouds and even lighting throughout the space, as opposed to building more architectural environments for each individual kitchen. With so many displays, this makes some sense as it is easy to circulate and find something that catches your eye. As we move ahead with future stores there will be more Total Home-type environments with seating areas and perhaps more enclosed residential-scale settings. Clients and their designers can wander the space with home plans and engage with Pirch or SieMatic kitchen specialists whenever they need help. Furthermore, guests can reserve a “dream room” for a little more privacy to stretch out, complete with media and enough room to have lunch. Speaking of lunch, Pirch can feed you a proper meal as well. Part of the idea behind the working appliances, in-house Bridget’s is a full working restaurant kitchen and guests can get a feel for how ovens and cooktops work while digging in to the local chef’s culinary efforts. Further back down the Boulevard is the Sanctuary, an enclosed spa-like bath area where guests can privately, on appointment actually disrobe and try out the equipment. In addition is a fully-functioning outdoor grill and seating environment, as well as laundry room concepts (also equipped by SieMatic). At the back, there are the expected rows of appliances on display too. 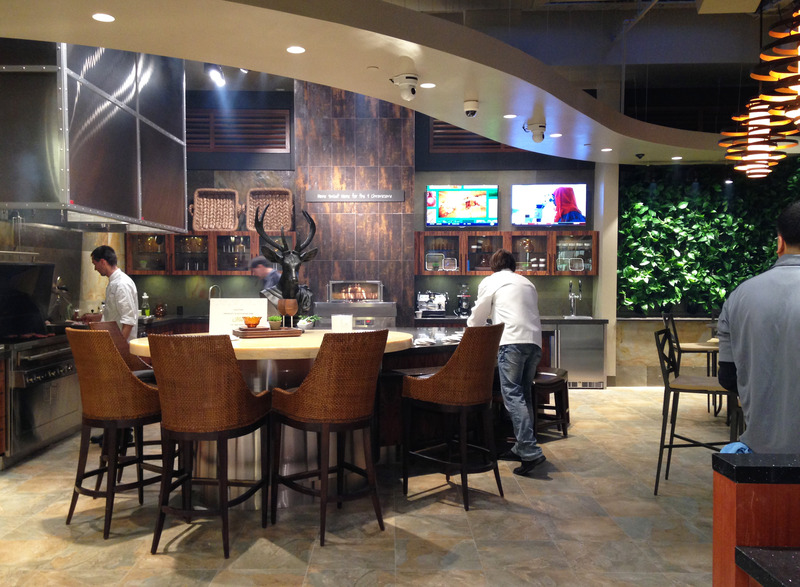 Although everything is very upscale and of a high-level of presentation, Pirch guarantees their pricing can match any local appliance distributor. This fixtures-shopping experience is really like no other. 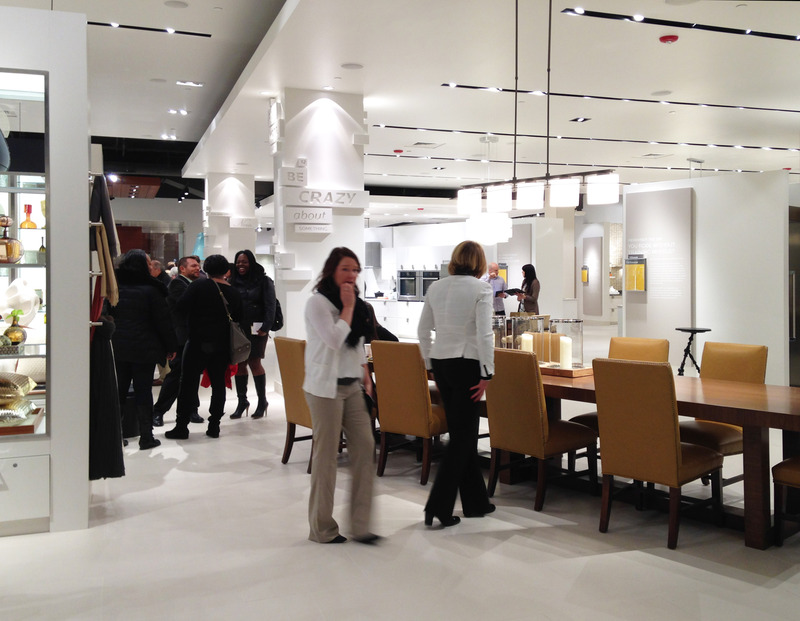 Perhaps the most interesting thing about Pirch are the locations. The first picture above, of the exterior, shows how integrated the store is on the outdoor mall. The adjacent shop is Lululemon. The usual upscale retail brands are all around, including decent dining as well. 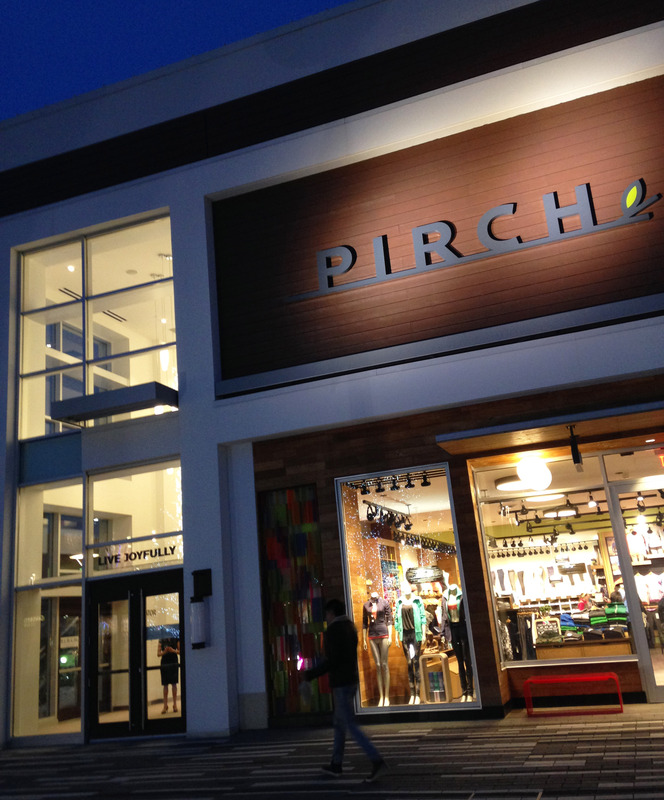 This is not a big box store sitting in a sea of parked cars; Pirch is integrated into the American luxury mall environment in a very unexpected way. As I understand, this is exactly their strategy – not only to serve need-based home renovators, but to entice visitors with a want-based showroom experience. 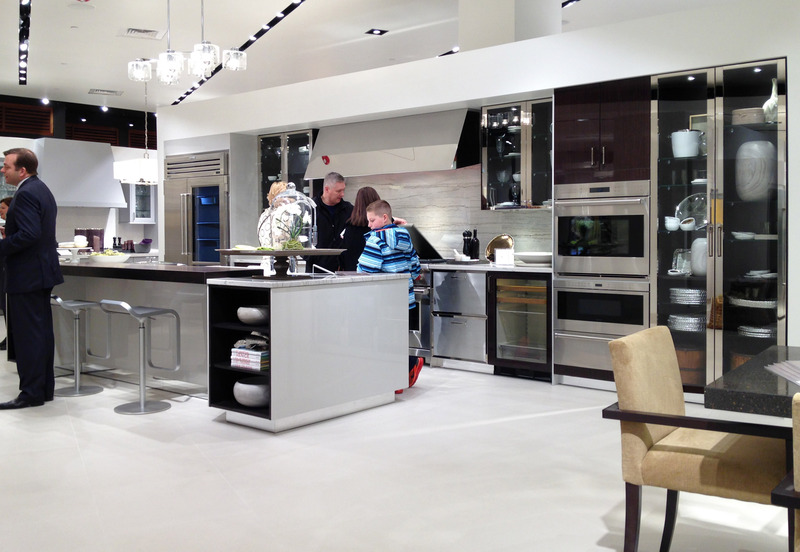 They are bringing luxury kitchens and baths right to the average shopper. After many hours of talking with guests and enjoying the day, our SieMatic group posed for a picture. 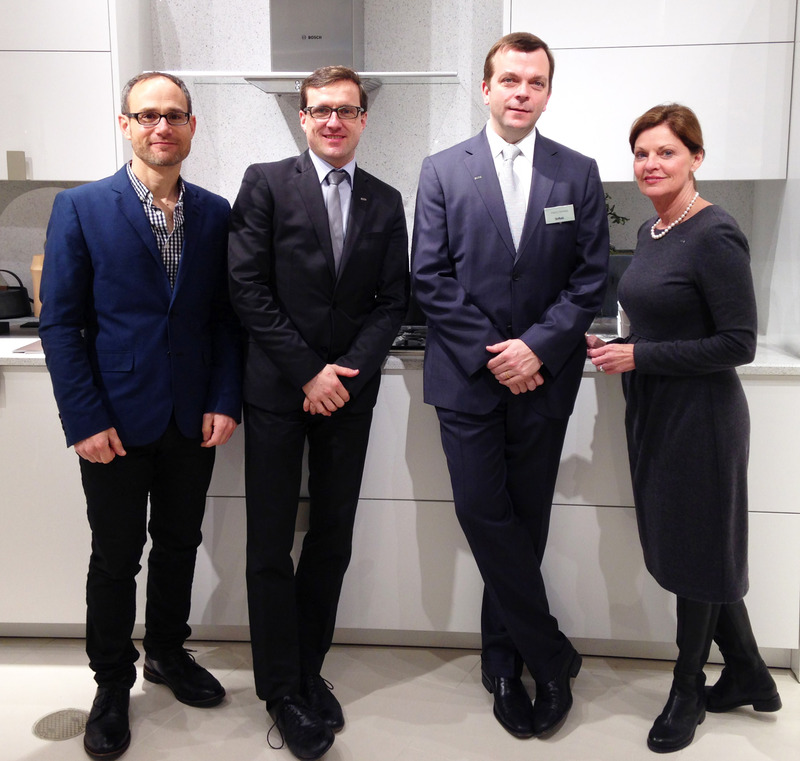 From left; Mick, Rainer Mueller, Hans Henkes and Marcia Speer of SieMatic. 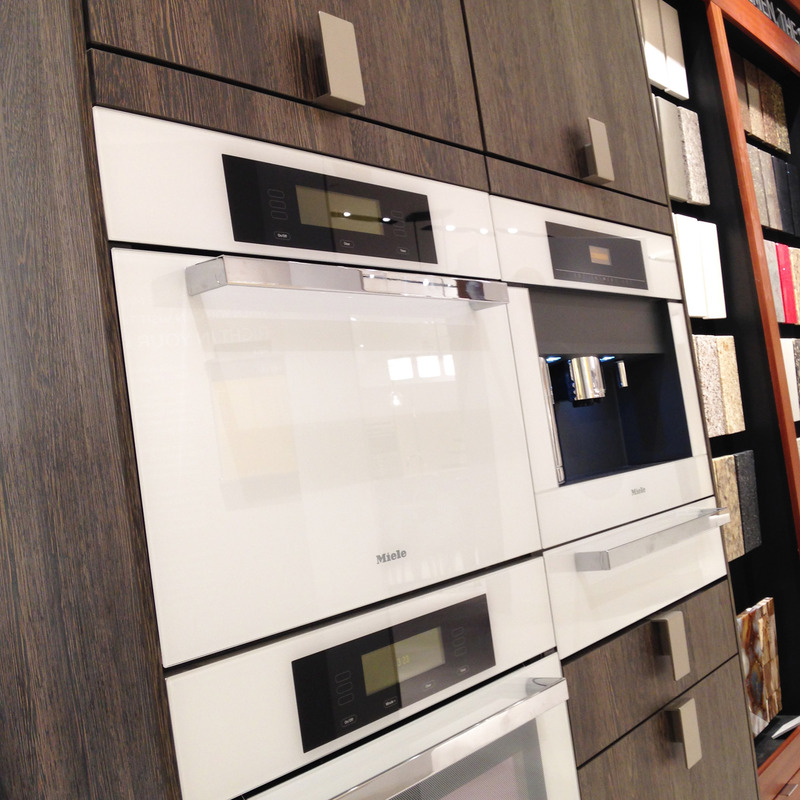 It was a long day of helping out with the SieMatic team and making sure our displays looked their best. I forgot to get pictures of the bath area, but it is very impressive with all the brands you could expect. 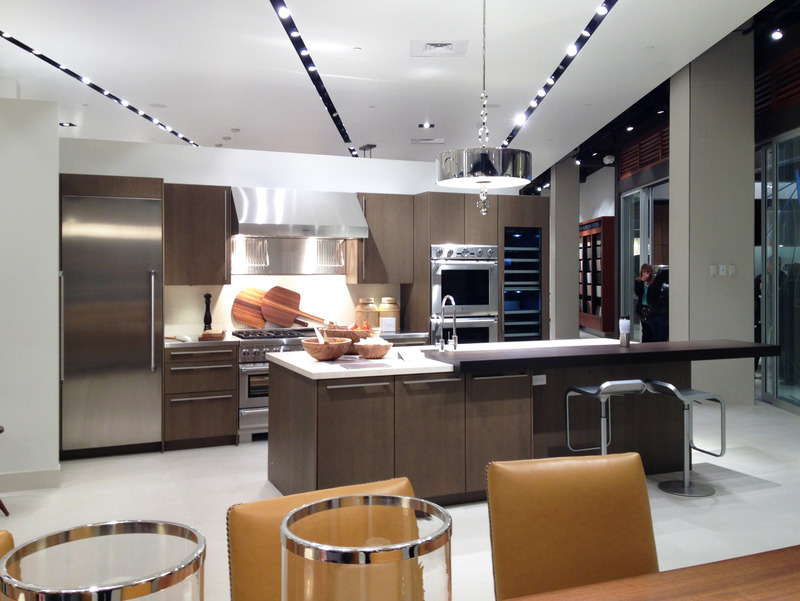 I highly recommend visiting Pirch if you are nearby. There are 2 more stores presently under construction – Dallas and Atlanta. 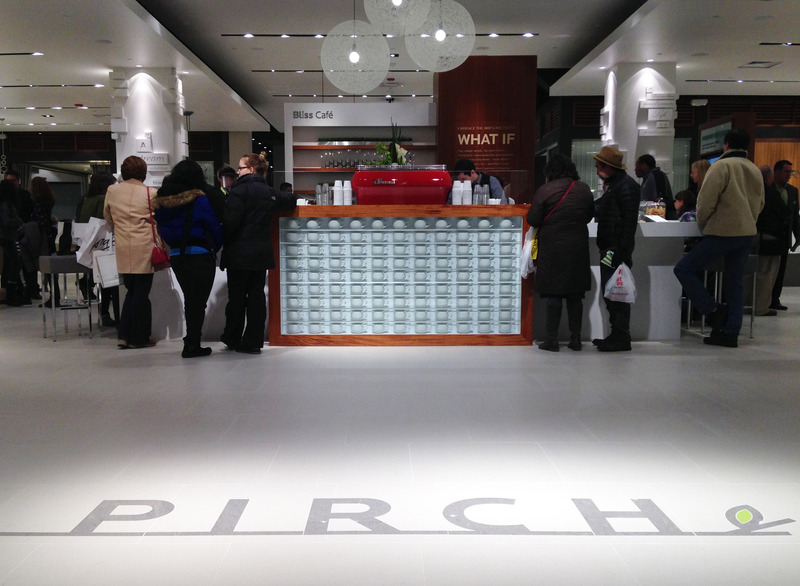 Many more markets are planned for the future – Pirch is an exciting company on the rise. 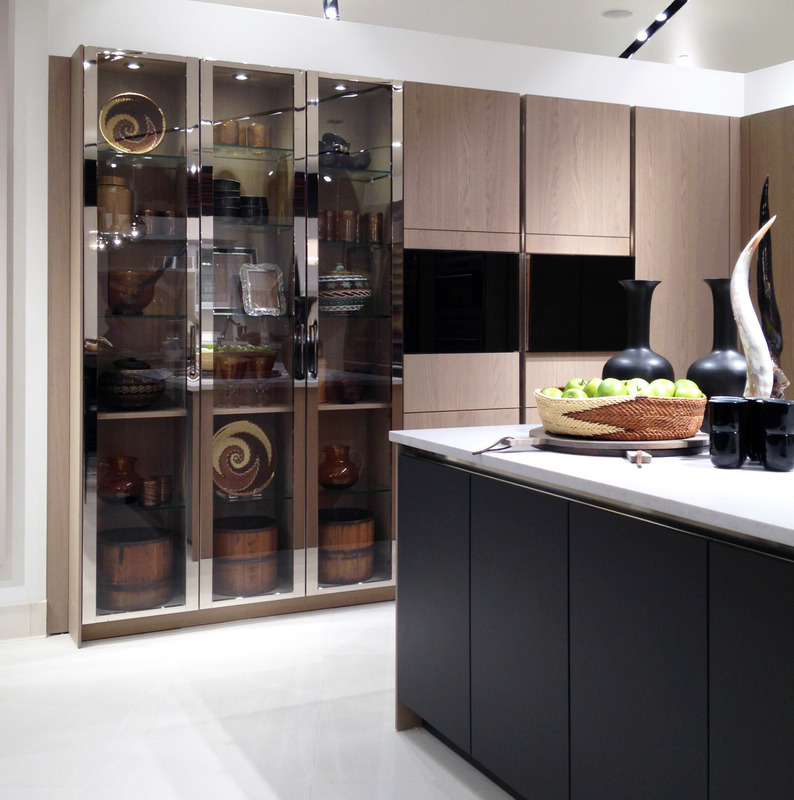 I am very proud to be part of the project, and very privileged to work with SieMatic on this wondrous retail adventure. 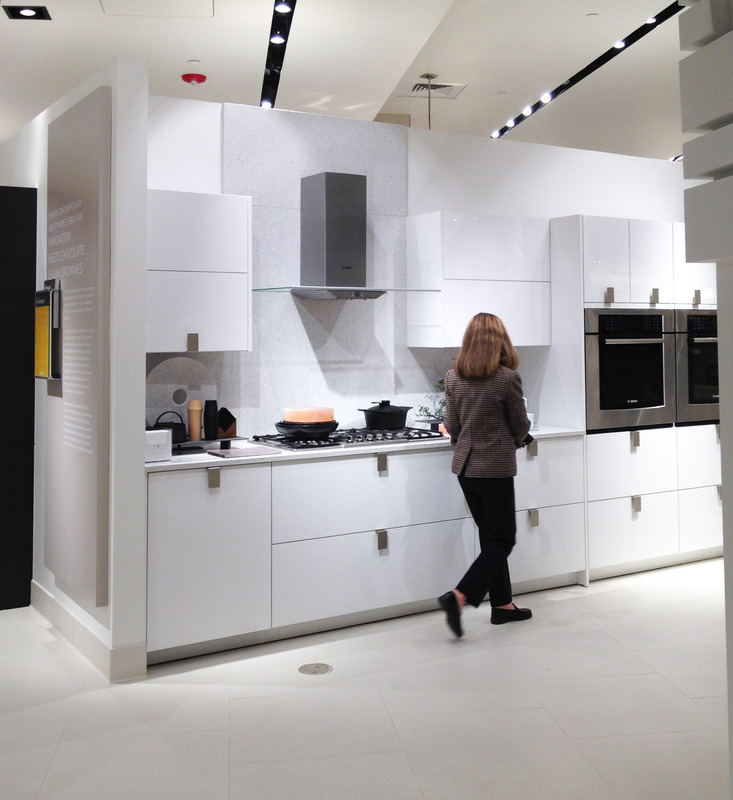 Best of luck to Pirch in Chicago.